Formerly known as Panda Software, Panda Security was launched in 1990. This security company was founded by Mikel Urizarbarrena in the Spanish city of Bilbao. The team behind it began by manufacturing antivirus apps for the Spanish market. Panda Security started to expand internationally in 1996. The expansion happened at the same time as the integration of additional features for the antivirus: an antispam filter, firewall, antispyware, and the technology to prevent cyber crimes. The company changed its name to Panda Security in 2007, a name under which they’re known to this day. 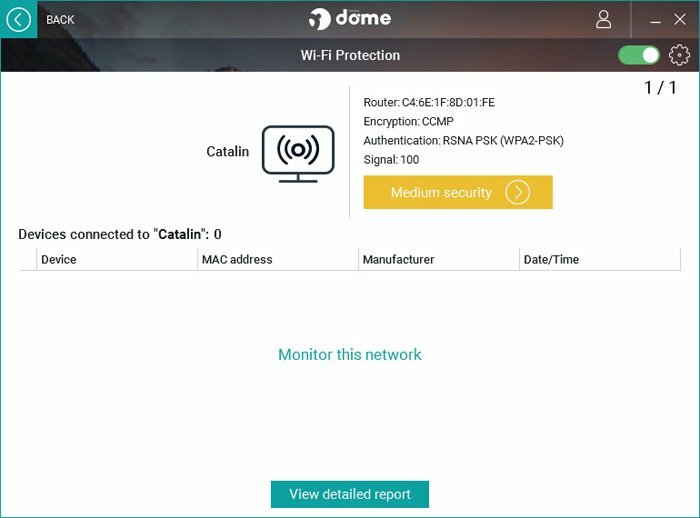 Panda Dome is the latest security solution developed by the company and it was launched in January 2018. Our review presents the conclusions we reached after testing and analysing this product for over two months. 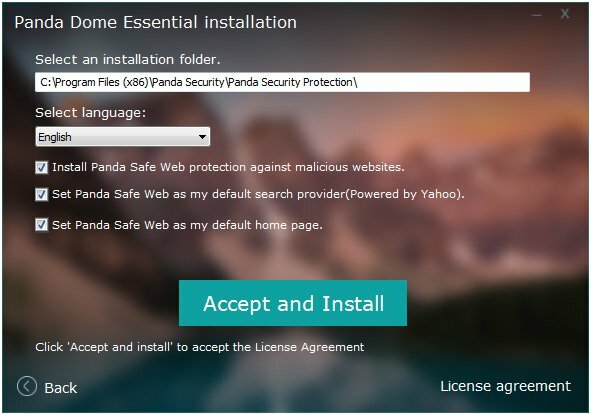 Before installing the new Panda Dome antivirus, we checked system requirements and the compatibility of this product with our computers’ operating systems and hardware platforms. The Panda Dome 2019 can be installed on devices running Windows XP (SP3), Vista, Windows 7, 8, and 10 (32 and 64-bit versions). The new security solution is also compatible with Android and it can be installed on mobile devices. As far as hardware resources go, the product needs a CPU that’s at least 300 Mhz and at least 128 MB of RAM. We installed the Panda Dome on PCs that run both the Windows XP SP3 (build 5512) and the Windows 10. If we talk about hardware, the weakest configuration we used to test the security solution was a computer using a 500 MHz and 256 MB RAM processor. The strongest PC we installed the Panda Dome on featured an Intel i7 CPU with 16 GB of RAM. The installation was quick and we didn’t register any problems during the process, no matter the computer or operating system we used. As with other products our review team tested (e.g., Bitdefender, NOD32, Norton Security), the installation kit is small. The rest of the files are downloaded once the process begins. 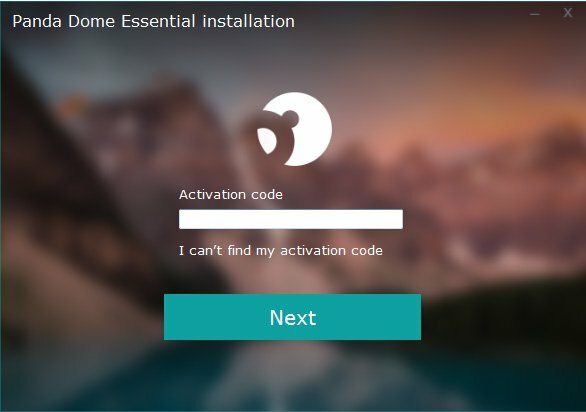 To fully activate the product, you need to type in the activation code offered by Panda Security after you buy their product. The code is sent via the email address you used to buy the security solution with. The Panda Dome Essential offers complete protection against cyber threats using the Cloud technology. You will receive, via the email address you used for the installation process, a password which lets you access your account any time you want. Use the account to take care of what happens to the devices that are protected by the Panda Dome. 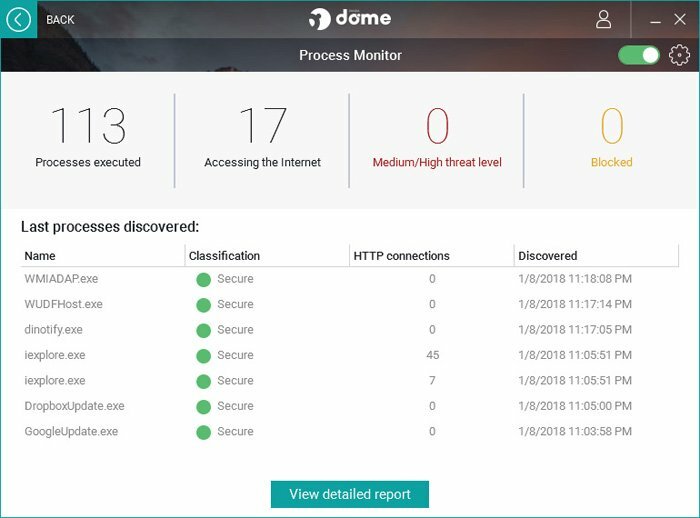 The Panda Dome is one of the biggest surprises we’ve had ever since we started testing different security solutions. 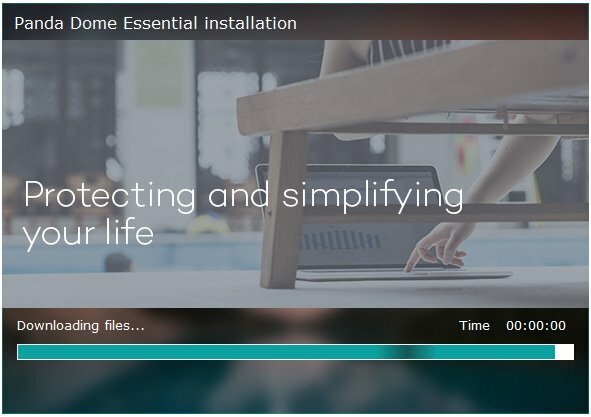 With its simple and easy to use interface, the new antivirus left a great impression on us from the moment it was activated. The in-built interface features tabs. Every single one of the important sections can be accessed from a single window. After the account is created, the application can also be opened via Panda Cloud. This lets you fully access the information related to the product and how you can use it. This option offers remote monitoring of the way the product is used on all the devices running it. Every time we do a review, our team takes a look at the features and capabilities of the product we test, so we can offer our readers the best analysis. VPN – in-built tool which lets you use the Internet without being intercepted by hackers or other malicious people. This module features the same search and virus detection engines used by the Panda Antivirus 2017. The engine has received numerous awards from various organizations that test antiviruses. This means that it delivers a very strong performance which meets the most exacting demands. 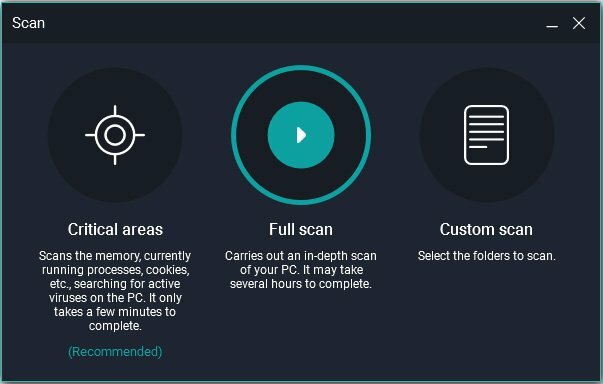 The Panda Dome Antivirus 2019 comes with three types of scanning against viruses and malware threats: critical areas scan, full scan, and custom scan. These allow for a quick analysis, as well as advanced or customized verification based on a user’s needs. 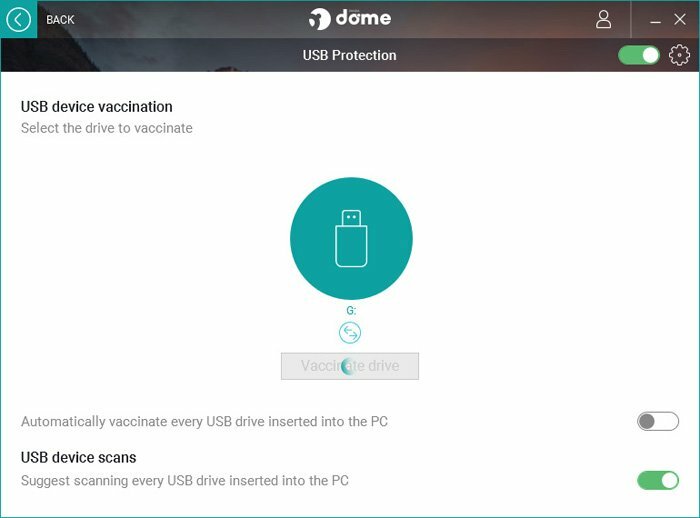 The Panda Dome antivirus also offers the possibility to stop the computer after such a scan, so that you can start a full one and leave the computer on. After the process is over and the potentially infected files are blocked, the PC will stop on its own. This lets you save precious time by avoiding scans when you’re busy using the device for something else. For this review, we tested how the Panda Dome acted when it encountered a virus. As usual, we used a database of approximately 25,000 types of virus to check how efficient and quick the antivirus module was. Results were excellent: all the infected files were detected and blocked, then either deleted or moved to quarantine. We also downloaded an EICAR-type testing file to see the product’s reaction speed during this action. 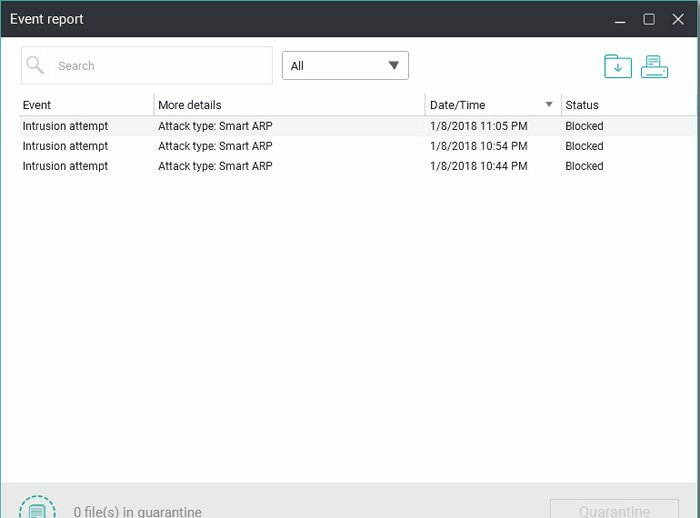 Results were great: the antivirus module reacted very quickly and the infected file was blocked and moved to quarantine in a matter of seconds. The antivirus module allows various customizations and different ways to detect and block cyber threats. 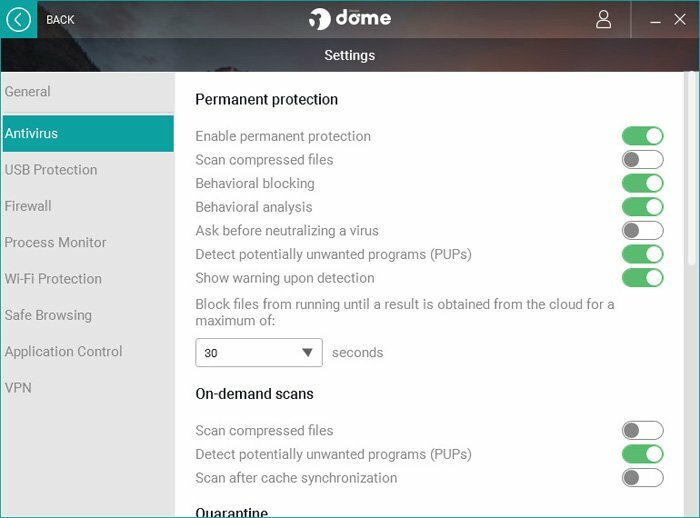 Depending on the settings chosen for this feature, the Panda Dome can block potentially unwanted programs (PUPs), either use or not use behavioural blocking and analysis, or can compare infected files with samples from the Panda Security Cloud. If you consider certain files or folders (including extensions) as being safe and you want to exclude them from the scanning, the antivirus won’t have any qualms with that. As such, the time spent on a deep system scan will be significantly reduced. After fully analyzing the antivirus for our review, we can say that it offers excellent results. The detection rate and response time are both great. 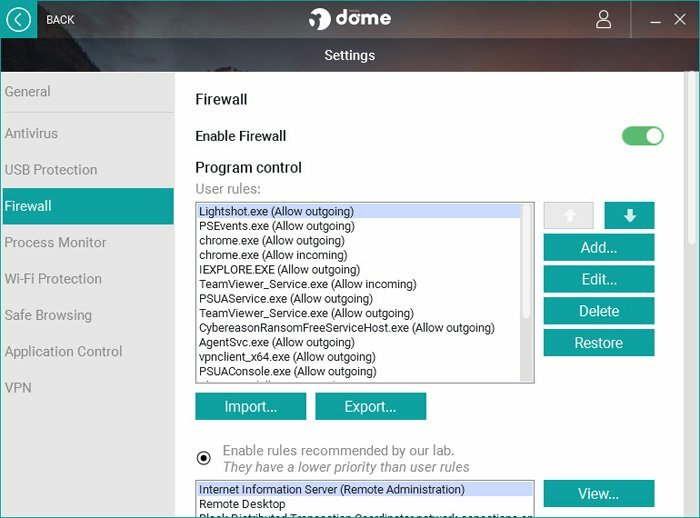 The Firewall included in the Panda Dome is very easy to use and configure. The module lets the user set those applications for which the firewall gives the green light when it comes to connecting to the the exterior via the computer’s ports. Based on the way these settings are performed, applications will or won’t be allowed to communicate with the outside. If you aren’t a pro at using a PC, the best option would be to follow the connection rules recommended by the Panda Security. The Firewall also comes with something called Intrusion prevention, which allows for advanced settings for around 20 other options. Like Land Attack, Sys Flood, TCP Port Scan, Smart DCHP and DNS, and so on. For this review, we checked the module’s efficiency. Results were top-notch: all the attacks we simulated against computers running the Panda Dome were stopped before they could take control of the devices. 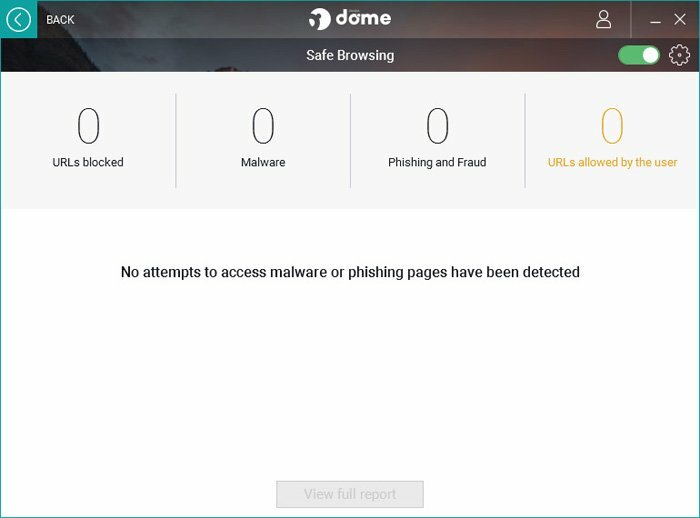 If you’re afraid of hackers and you want an application that’s easy to configure and keeps you protected against them, the Panda Dome Antivirus is a very good option. This is another useful tool featured by the Panda Dome Antivirus. With it, you can safely use the Internet any time you want. Whenever a website is infected with various types of malware or viruses, this module will automatically block it. Safe Browsing also protects users from phishing attacks thanks to real-time updates of infected sites. These are offered by Panda Security’s Cloud technology. The option is very similar to the one featured by Bitdefender, another top security suite we reviewed not too log ago. We tested the Safe browsing module included in the Panda Dome 2019 with great success. All the websites that were infected or used phishing methods were blocked. Have you always wondered what happens in the background when you use your PC? The Panda Dome antivirus offers full details for the processes taking place there. It also monitors the ones which are dangerous for your computer. The processes are divided into several sections. The most harmful of them are marked in red, then blocked. The module also offers data related to the method of connectivity and use of the Internet, while at the same time giving out information having to do with the start of the processes that are being monitored. In case you want an in-depth tracking of background processes combined with making the way they work safe, the Panda Dome 2019 is your pick. 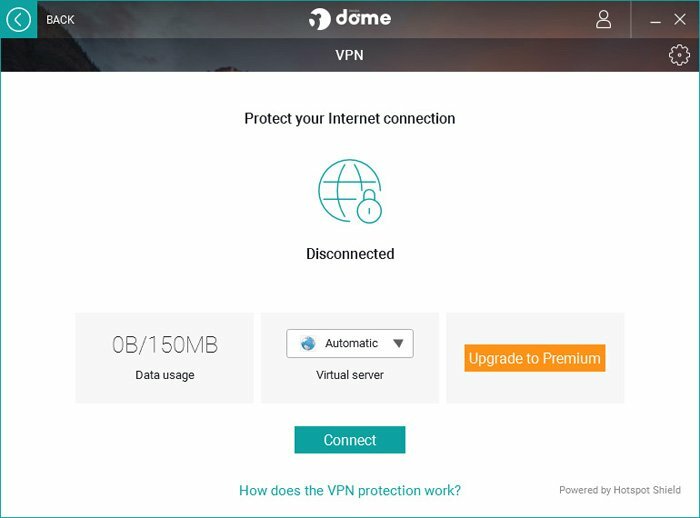 The new Panda Dome has an useful in-built VPN module. It makes connections safe and hard to intercept by authorities. Because this module uses data encryption, you can choose safe IPs from 19 countries. The speed we recorded during our tests for this review was very good. The VPN did not slow its navigation speed down and the same happened for the amount of time it needed to open web pages. The only possible drawback is that there’s a limit when it comes to data usage: 150MB/day. It’s enough if you use this type of connection on and off. To enjoy unlimited access, you can buy a backup licence directly from the application’s menu. My devices – it offers control over those devices that also feature this security solution. 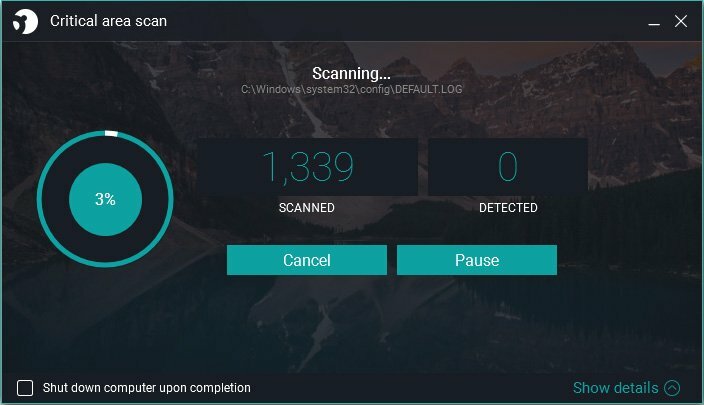 This option keeps your computer safe from applications and unknown online programs which can endanger it. 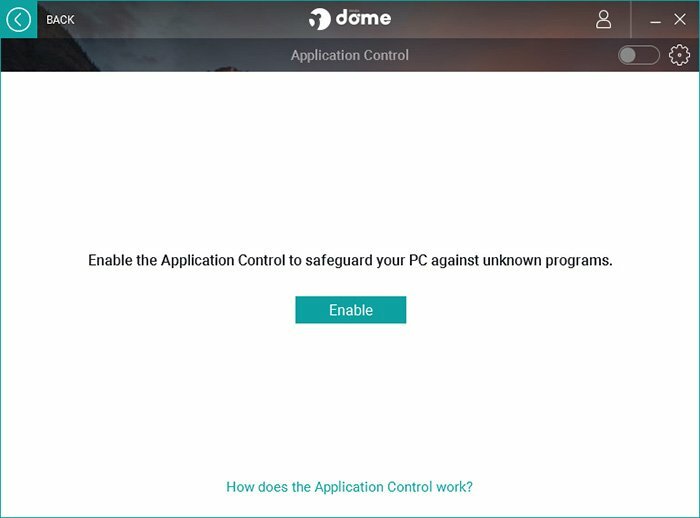 The Application control feature is disabled when you first run the antivirus, but you can quickly turn it on by clicking the Enable button from the product’s main interface. Once the feature is enabled, all suspicious applications are automatically blocked via behavioural detection. Our testing of the Application control went very well. The dangerous applications we tried to trigger were blocked in the shortest amount of time. Want full protection from viruses found on mobile devices connected to a PC via its USB ports? Turning the USB Protection on can be of great help. This module performs a real-time scan of every single USB device that’s connected to your computer. The result? It removes all possible cyber threats that can appear. The USB Protection also features a manual scan of the USB devices. You can either activate or deactivate this module, depending on how much you use it. Panda Security have included the possibility to detect virus-type cyber threats in their most recent product. These threats are difficult to identify using other methods. 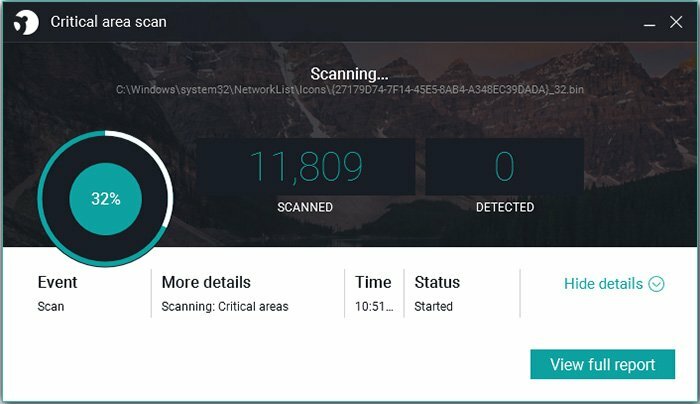 If you think your PC is infected, scan it via the Panda Cloud Cleaner. This option is only available with the Rescue kit. This section also features an option which allows you to create a USB stick. The latter can disinfect a computer which refuses to boot because of various problems. The scanning and removal of viruses is done via an external server represented by the Panda Cloud Cleaner. We tested the way a couple of blocked and infected PCs were “repaired” using this technology. Each of them successfully booted after the viruses were removed. Wi-Fi connectivity has become another weak spot of mobile and desktop-type mobile devices. The probability of connecting to an infected or hacker-owned router has increased by a lot. 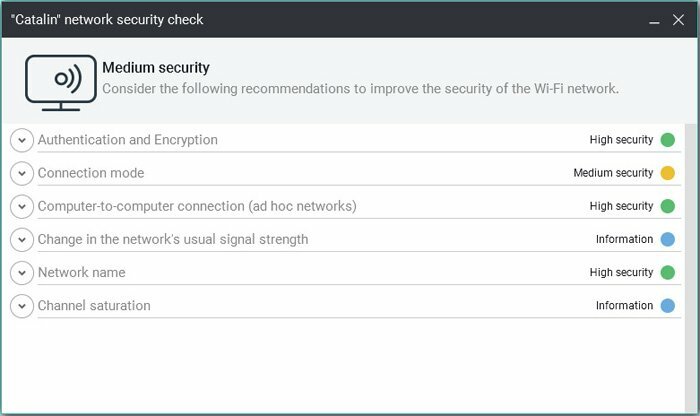 The latest Panda antivirus has a module that checks and secures wireless connections, so you can connect to a Wi-Fi router without worries. This module verifies all the potentially dangerous spots having to do with how a wireless connection is created. You can then look at a detailed report based on its findings. After a thorough read, you’ll be able to improve the network’s safety and the way you connect your device to Wi-Fi networks. Attacks that use keylogger applications to steal data have greatly increased in recent years. Hackers rely on these methods more and more because, once certain data is stolen, they can make an immediate profit out of it. Imagine that you connect to your bank account and a hacker gets access to all the data you typed with your keyboard. This is the kind of attack which is easily prevented if you use a virtual keyboard that’s hard to track down by keylogger programs. 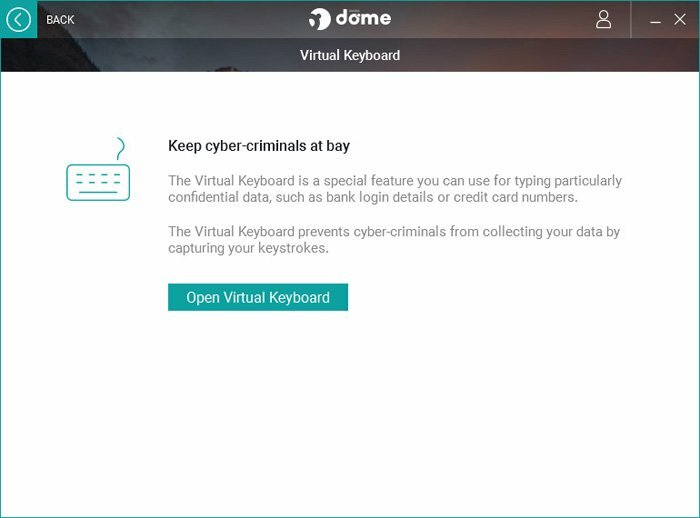 The Panda Dome 2018 is pre-installed with a virtual keyboard offering full protection from all kinds of keylogger threats. During our tests, we used two such programs. None of them was able to detect the data we typed in using this keyboard. This one lets you access the other devices which run the application and see all the cyber threats they encountered. 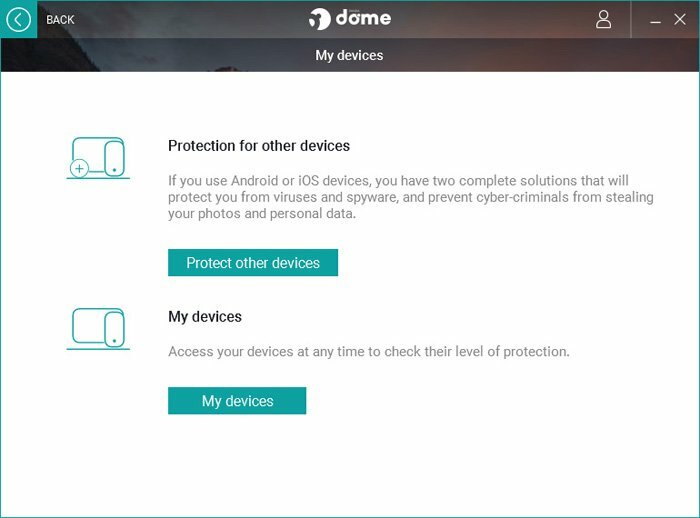 From its interface, you can initiate the protection for devices. They will then receive new IDs from the account you own. We tested, for our review, the impact that the Panda Dome had on the speed of PCs. Results were excellent. With the exception of the computer with the weakest possible configuration for our tests (a 500 MHz CPU and 256 MB RAM), the impact on the computer’s speed was insignificant. The speed of the slowest device was affected only when we began a full scan. As such, the Panda Dome 2019 can be successfully installed on every PC that has a decent configuration. Panda Security’s support team has improved the way users contact them. The new Panda Dome lets you get in touch with them directly from the interface. The latter also offers access to a complete database featuring detailed info on how to use the security solution, as well as access to the Panda Security forum complete with interactions between users and the technical support team. We read the documentation offered by Panda Security and concluded that is was complete and very easy to use. For this review we also contacted the support team to see how they interacted with clients. As a conclusion: the team offers quality informations and professional feedback. 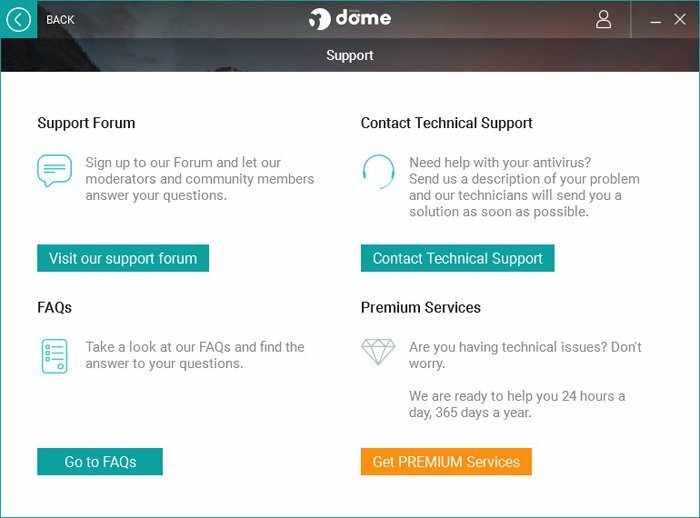 If you want a strong team behind the product that protects your device from online dangers, you can definitely rely on the people behind the Panda Dome. The Panda Dome is equipped with very useful features. The features-price ratio is excellent if you compare it to other products we tested. You can have this product for only $23.49 by accessing this link. 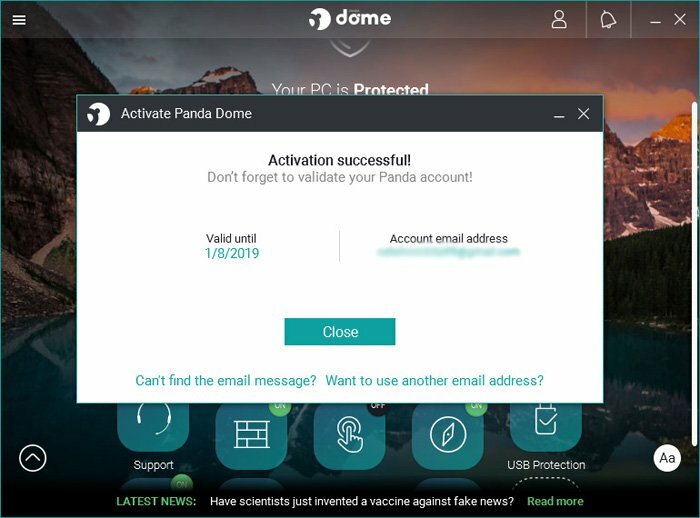 If you want full protection at a very good price, the Panda Dome Antivirus 2019 is a great option. At the time of our review, the Panda Dome hadn’t yet been officially released, so there weren’t any other dedicated testing teams to offer their own feedback. However, taking into account the prizes that the Panda Antivirus and the Panda Internet Security won, as well as the fact that the new Panda Dome uses their detection engine, we can safely say that this is one excellent security solution. We will update this review with additional data related to the awards offered by AV Test and AV comparatives as soon as we have it. Panda Security offers several security solutions, each of them with its own protection range and distinct features. One of them is the Panda Dome Advanced 2019, which you can buy here for only $29.49. Its main additional features are: Parental Control, Call blocking, Application control and Real-time tracking of your family. The Panda Dome Complete 2019 is another security solution you an use against cyber dangers. Compared to the previous product we mentioned, this one features Password management, File shredder, Ransomware protection, and it lets you make backups for the data stored in your PC. The product also offers Anti-theft protection for mobile devices running Android. The Panda Dome Complete 2019 is compatible with systems that run Mac, making it a good reason to choose it. Grab yours from here for only $47.49. The Panda Dome Premium 2019 is the third product from this range. It comes with Data backup in Panda Cloud Drive and Premium VPN. The product can be yours for $77.49 if you go here. 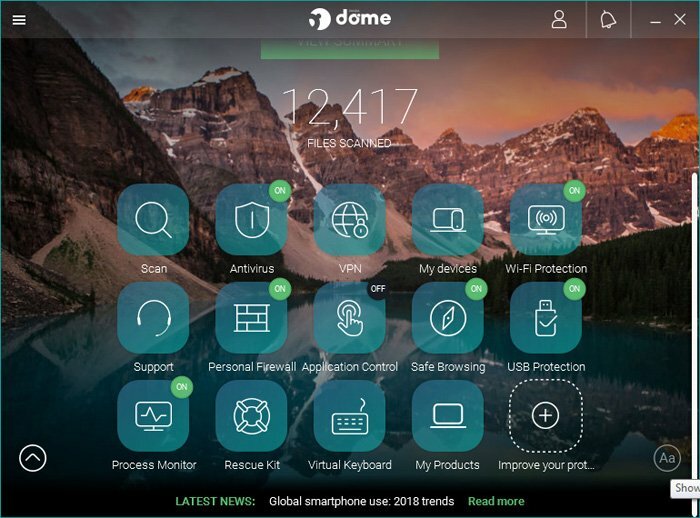 The new Panda Dome is one of the biggest surprises this year as far as cyber security solutions go. With its user-friendly interface, excellent features, and a very good price for what it offers, this product is a strong contender for other security solutions. 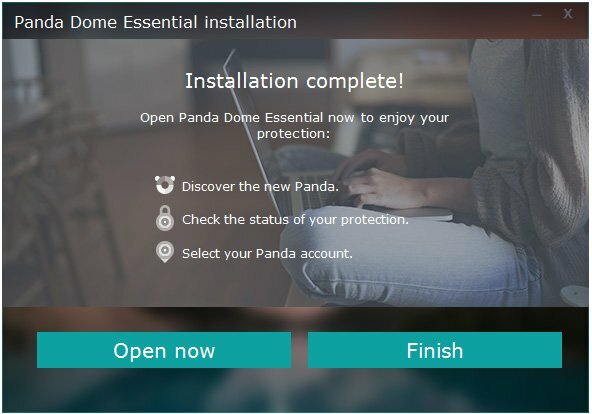 The Panda Dome is a great choice if you want to protect your computer against various threats. 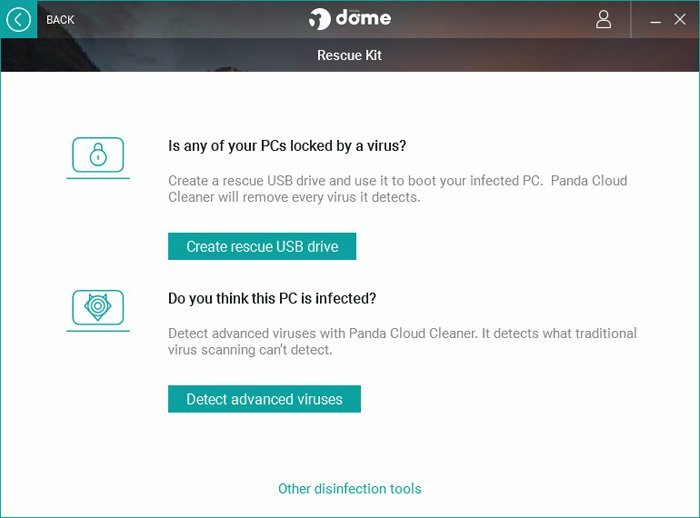 Panda Dome Antivirus 2019 is a top-notch security software solution. Compatibility: Windows XP (Service Pack 3), Vista, Windows 7, 8, 8.1 and 10. iOS 7 and later, Android 4.0 and later. You can buy the Panda Dome Essential here for only $23.40. The price includes strong support and very helpful features that keep your PC safe from cyber attacks. 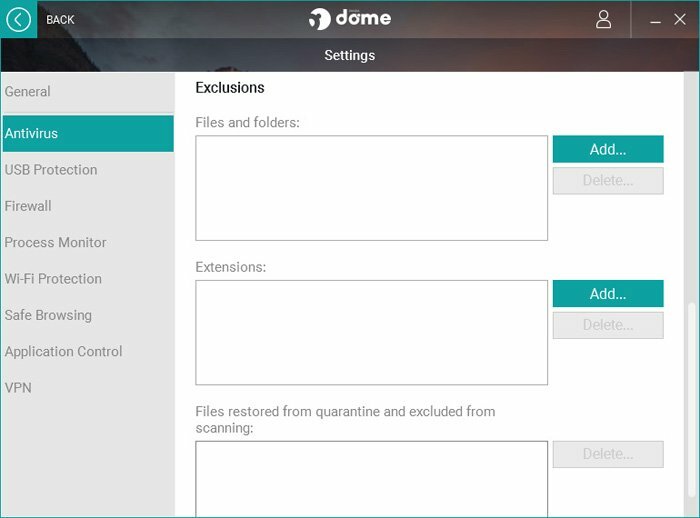 If you want to use only certain features, you can buy either the Panda Dome Advanced (Extra: Parental Control, Block access to inappropriate content, Anti-phishing, Call blocking, Application control and Real-time tracking of your family), the Panda Dome Premium (Extra: Password management, Data backup, Remotely wipe of data, File shredder, Ransomware and financial data protection), or the Panda Dome Complete (extra: Premium VPN, data backup in Panda Cloud Drive). The number of cyber attacks has grown approximately four times last year. Use the Panda Dome security solution if you don’t want to become the next victim.